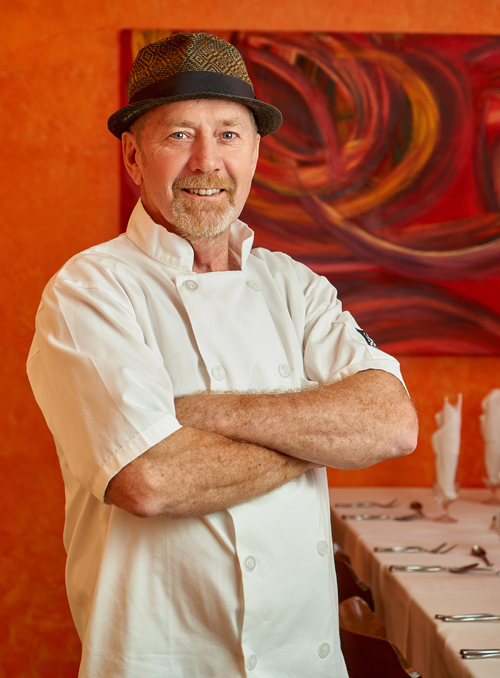 Chef Randy Reynolds’ surprise menus excite the adventurous and push cautious diners out of their culinary comfort zone. Chef Randy Reynolds sets down a plate on which pink smoked salmon is neatly stacked as a square tart, just warm enough to be offset by a smear of cool, fresh sour cream, sprigs of dill, and cucumber. This amuse bouche is typical of the sort Randy would serve to prime the palate for what can be a three-hour dining experience at Beaujena’s French Table. In this case, though, it is a tasting with Ciao! He presents another dish, again without any descriptors. The vibrant stalks of asparagus, curls of yellow lemon zest, and orange fish roe which top the thick housemade pasta are instantly identifiable. As the noodles begin to unfurl off the fork, a new taste and texture emerges. Randy smiles as the guesses come. Some kind of fish? Octopus? “Close,” he says. It is sous vide calamari, a technique that he perfected after tasting the perfect octopus in Baja, Mexico. All of Randy’s culinary skills are self-taught. In fact, being a chef and restaurateur isn’t actually his full time job; he’s a financial planner from 9 to 5, four days a week. But on Friday and Saturday nights, he is head chef at one of the city’s most unique culinary gems. For almost 10 years, this fervent chef has been dreaming up and executing French and Mediterranean inspired seven-course, prix fixe dinners as his passion project co-owned by and named after his wife. Tucked in a quiet St. Boniface neighbourhood, Beaujena’s pulls together both the expected and unexpected for a culinary experience that challenges customer’s preconceived notions about what they “like” to eat. “We don’t overlook the fact that this is a huge leap for some people,” he acknowledges. Though some diners may be a little apprehensive, they’ve already opened up their mind to a new experience simply by coming in. Beaujena manages the front of the house, and has perfected her pre-dinner preamble to both ignite adventurous diners and quell the fears of nervous ones. She does give customers the option of knowing what each dish is as they arrive, but diners almost always choose to be in the dark. “Customers know the chef will push you a bit; you’ll have something you’ve never had before, but we just ask you give into the surprise,” says Randy. Chef Randy has dabbled in many career fields – he’s been a potter, writer, and contractor – but cooking has been a lifelong pursuit. Even as a kid he loved to create things in the kitchen, a talent borne out of necessity with two working parents. As he grew older, he became a collector of all things culinary: cook books, knives, and knowledge to fuel his abilities in the kitchen. The turning point from home cook to public chef was when his daughter, before leaving on a trip to Italy, asked him to make an authentic Italian meal for 19 of her friends. While he can’t remember exactly what he cooked, he never forgot the feeling he got from creating a six course, Italian experience his way. Beaujena’s French Table opened in 2006, just three years after that memorable moment. When, two years into the venture, his head chef quit, Randy stepped up and found himself acting as prep cook, sous chef, and head chef all on his own. More than 10 years on, the business has involved into a restaurant unlike any other. In an industry that can be tough and competitive, the couple has created an oasis of, dare we say, fun. Removing some of the typical financial obstacles – they own the building, for instance, and open only on weekends, relieving the pressure of filling seats daily – allows them to turn each meal service into their own personal dinner party. The menu changes monthly, a real-time exploration of Randy’s current culinary fancies. Careful planning ensures that every experience is new; it’s rare that a dish will ever be repeated. While mainly based in French cuisine, Randy will often pepper in other worldly influences based on his travels. However, he keeps most of the dish’s ingredients as close to home as he can. Developing close relationships with local meat, grain, and produce farmers has been a mandate for the restaurateur who feels it’s not only a more ethical business option, but frankly, just tastes better. To this day Beaujena’s remains a two-person show. The couple joke about never having the option of sick days, and even when Randy severely cut his hand one evening, he waited until dinner service was over before heading to the hospital. However, not having employees gives the couple the freedom they’re looking for with this culinary venture. Anything more – whether it be staff or additional seatings – would turn the restaurant into a “job.” And you don’t want to ruin your hobby by turning it into work, quips Randy as he places down another vibrant dish. Resisting the urge to ask and analyze ingredients, we take a bite. It’s delicious.